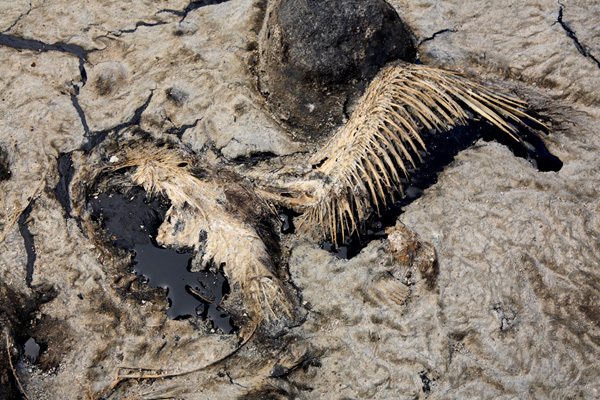 Oil pollution at sea can have devastating consequences for sea life – especially seabirds. When their feathers get covered in crude oil, they are unable to fly and death is almost certain. PRP is a 100% environmentally safe product that can be used to clean oil and other hydrocarbons from the feathers of sea birds, safely, quickly and without in any way harming the bird or the integrity of their feathers. PRP Powder consists of tiny spheres of treated bees wax, which contain nutrients. When a wax sphere comes in contact with spilled oil, it binds with or encapsulates the hydrocarbons. Nutrients in the sphere help micro-organisms (microbes) from the immediate environment flourish until they eat every droplet of oil. PRP Powder will absorb and remediate, over time, more than 20 times its weight in hydrocarbons. This process is called bioremediation. PRP applied to the feathers of the bird, will initially absorb the oil and encapsulate it. The microscopic bees wax balls that make up PRP bond with the oil, rendering it inert and no longer sticky, allowing the oil to be brushed from the feathers. Any powder remaining on the feathers will contain the oil and will continue to bio-degrade the oil until it is all gone. Any seabird that comes into contract with oil on water that has been treated with PRP will emerge from the water with no oil or other hydrocarbon sticking it its feathers. This is because PRP has encapsulated or absorbed the oil, and will prevent it from sticking to the feathers. PRP Powder is proven to totally remediate and eradicate hydrocarbon pollution on the feathers of sea birds, allowing them to fly free once again.